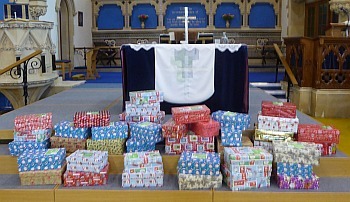 Today we sent off 42 shoe boxes all wrapped up and full of presents for Christmas to those in this world who would have none. May they bring the Joy and love of God in the world to those children who open them. People brought non-perishable food items on Harvest Sunday, Sept. 25th, for the Asylum Welcome Food Bank. 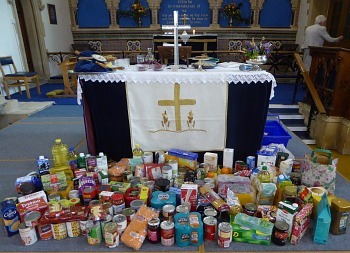 Even more asylum seekers are now needing help and last year 1121 bags of food were given out. 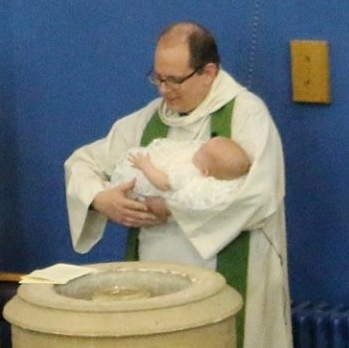 The Moderator of the General Assembly of the United Reformed Church, Revd. 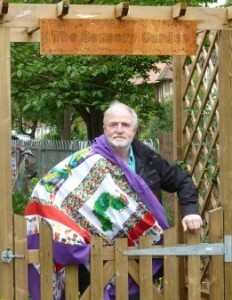 Kevin Watson, visited Trinity Church during the weekend 6th-7th May. 1. On Saturday 6th May at 3pm, ''Alive and Still Kicking' - ministry with the elderly' where Kevin shared his experiences and Trinity members shared theirs. 2. Kevin conducted the morning worship on Sunday 7th and spoke on our effect on the planet, and how we have a choice when it comes to sin. 2017 marked our 8th and biggest yet Experience Easter, visited by around 500 people. Between Wednesday 30th and Friday 31st March 390 school children and their staff joined us, including groups from Kingfisher Special School, who had their very own sensory Easter Encounter back at school. Then on Thursday 30th March there was a Musical Easter Journey with Abingdon Gospel Choir followed by a Family Open Morning on Saturday April 1st. 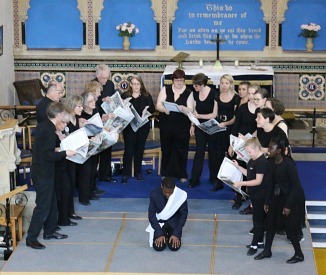 Witness: On Sunday 9th April at Trinity Church, there was a Circuit Service in the form of a performance of the musical, Witness (composed by James Garnett). Witness tells the Easter story from the perspectives of those whose lives it touched, including bystanders, Jesus' disciples, those in power, and - in particular - the crowd. Through songs and monologues we were invited to experience a range of responses from the excitement of Palm Sunday to the desolation of Good Friday and the wonder of Easter Day. 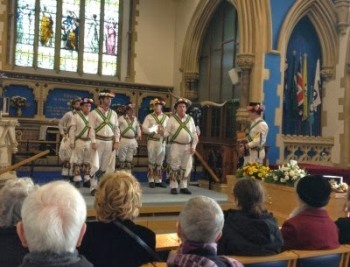 The performance was watched by about 100 people. Refreshments were served afterwards, and there was a retiring collection for charities chosen by the cast. On 30th August there was a Welcome Service at Trinity for Rev Ian Griffiths, who will be Minister of All Saints and Trinity. There was a large congregation and many visiting ministers. A big ‘thank you’ to everyone who contributed in any way to this joyous occasion for Trinity, All Saints and the Circuit. To judge from the wonderful spread of savouries and cakes provided for tea by both churches, All Saints and Trinity co-operate well on the catering front! We look forward to more opportunities to work together under Ian’s leadership. Prayer written by Richard for URC 40th Anniversary. we pray for the courage to trust the direction in which you take us. we smile at your great skill and give thanks. may we also know when to set the oars of our boat at rest. may our energy meet with the current and carry us on. In your love, in your way, in your creation. 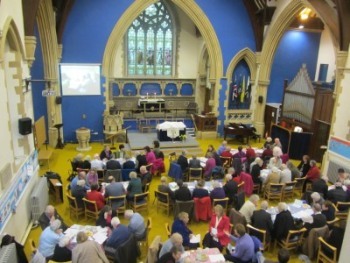 On Sunday, March 16th, the cake sale after the morning service raised £89.25 . 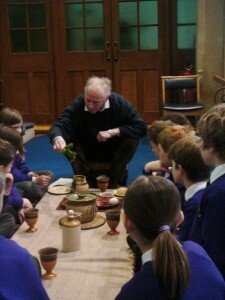 At Trinity Church on 17th January there was a Sevice of Thanksgiving for the life of Leslie Argyle. Leslie had been a member at Trinity since the Primitive Methodist Chapel in Ock Street Closed and joined forces with Trinity in 1945. He also worked for over 40 years at Trotman’s Bakery, and when that was taken over by Holmes, he joined Day's Bakery in Edward Street. He used to bake communion bread for Trinity and the special bread shaped like a sheaf of corn for harvest. He had a love of music and dancing and joined the Abingdon Traditional Morris Dancers in 1950 and was elected as Mayor of Ock Street (leader of Morris Dancers) in 1980. One of the hymns was "Lord of the Dance." There was a report back from the recent meeting about inviting a deacon to the local Methodist Circuit now the number of ministers is to be reduced by one. 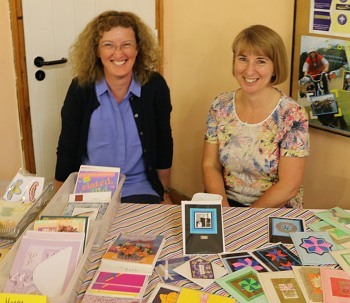 There was a wish to continue the link with a local URC Church, and to ensure regular visits from URC preachers. Aston Tirrold URC was mentoned as a possible partner church. Rev. 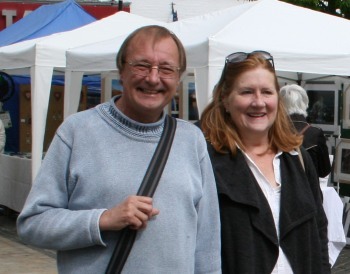 Ian Griffiths' Welcome Service will be at Trinity Church on Saturday 30th August at 3:00p.m. when Rev. Peter Hancock, Chair of our District, will be the preacher. There was a report by the Faith in Action Group. 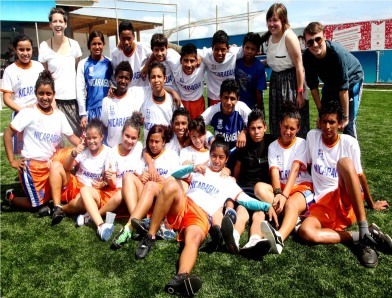 This Lent, Trinity will be supporting the Street Child World Cup. Plans for the fifth year of Experience Easter are well underway, and members were encouraged to help either setting up, or taking part. Two new Hello Abingdon magazines have hit the streets! 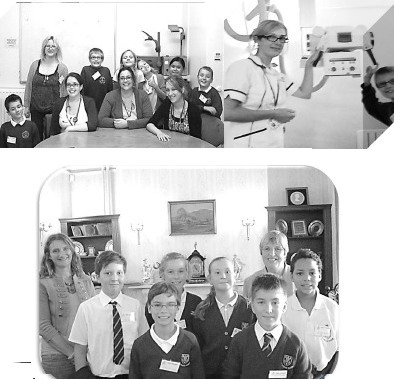 After a marvellous visit to Abingdon Community Hospital, a group of Year 5 children from Thameside Primary School have produced "Thameside Tiger Hospital Care", a fully-illustrated introduction to the staff they met during their visit. Thomas, Oliver, Miya, Harry, Jamal and Phoebe, from Year 6 at St Nicolas C of E Primary School, interviewed Councillor Lesley Legge & Heather Brown from The Choose Abingdon Partnership. Their magazine St Nicolas world of Abingdon explains some of the ways in which Abingdon caters for tourism. Both magazines are the result of workshops run by TrinityLearning, with the help of The Community Covenant. 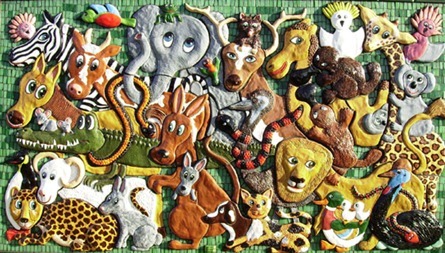 The project enables forces and local children to find out about their community and work together as a team. Thanks to the help of Welfare Officers at Dalton Barracks, every family stationed there will receive a copy of both magazines. 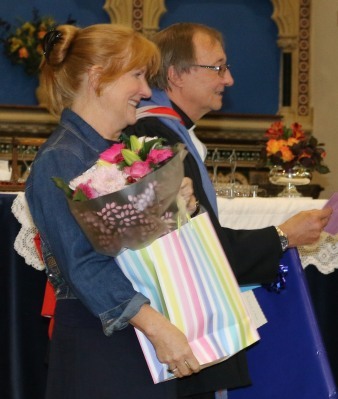 Following the successful visit by the Rev’d Ian Griffiths and his wife, Tabitha, and with positive responses from both churches, an invitation was extended to Ian by the Circuit Invitation Committee. This is for an appointment commencing on 1st September 2014. Ian has accepted the invitation and says that he will be delighted to come to Abingdon. The Annual Church Meeting will took place on Thursday, 21st November at 7.30pm. At the meeting the Annual Reports and the Accounts for the year 2012-2013 were presented. 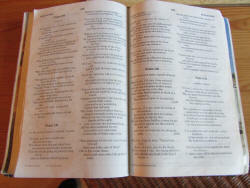 The Annual Report details the activities of many groups in the church. For example Revd Richard Bittleston writes about Home Groups "This is one of the most active and enduring facets of Trinity life. I really enjoyed discovering the wealth and diversity of these groups early in the year. Over 60 people in the Trinity family participate on a regular basis in Home Groups that run the year round. 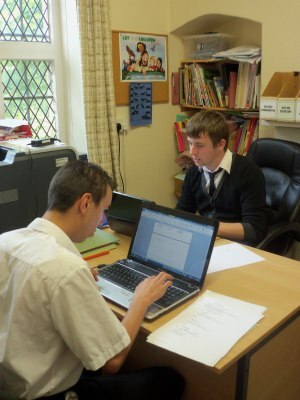 They are hosted and facilitated in a most welcoming and friendly way, and the quality of fellowship is very special. My thanks to all those who open their living spaces to these groups, and to the facilitators who rise to the challenge of making sure that lively conversations take place." The hall in the Conduit Centre underwent a major redecoration during the 2013 summer break.The painting and woodern floor renovation were done professionally, but the initiative, organisation, preparation, repairing and replacement of hall furnishings have been achieved by a great number of church members working together. A huge THANK YOU to everybody involved. 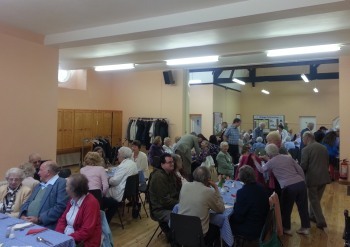 The first major event in the hall was the Harvest Church Lunch on 29th September 2013. Instead of the normal rows and rows of seats in Trinity Church on 3rd February 2013 there were tables with pink or blue tablecloths for what was going to be a Cafe style service - the intention being to generate round table discussion, while people were served with tea or coffee, and find out what people most valued at Trinity, and their hopes for the future. The sheets resulting from the discussions were collected in along with the normal collection, after communion had been served. Moving into a new area can be difficult. You need to find your way around, make new friends and start new topics at school. That's why we thought it would be good for the children of forces' families based at Dalton Barracks to work with local children on a newsletter about Abingdon. 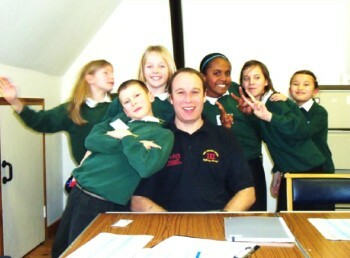 This newsletter has been put together by six pupils from Carswell Community Primary School. The area’s transformation from derelict concrete and scrub to a place of magical tranquillity for children and staff has brought together people from all over the community, in a project very much in keeping with the school’s title. I am a Fitzharrys student in year 10 and this is my work experience diary/blog. I ended up in Trinity Church by accident to be honest, as I was originally meant to be at Milton Park ICT centre but unfortunately they had to drop me due to staff shortages. Trinity gave me a place so I didn't miss out. Nearly 450 primary-aged school children, accompanied by almost 100 adults, took a journey back in time at Trinity last week. They not only heard the story of the first Easter, but experienced the events of that week through a series of interactive workshops. They wrote prayers on palm crosses, helped wash each other’s hands, shared bread and rolled up fears into plasticine, as they explored how Jesus and his disciples had felt and related this to their own lives. 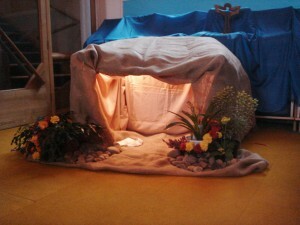 On Sunday, the congregation joined the children’s journeys as we worshipped in the centre of the Easter Experience. We listened to the stories & took part in the reflective activities. Helpers shared their experiences of the week and after communion, we shared the peace by singing "Shalom my friend"
Read more at Trinity Learning. Monday 8th November marked the official launch of TrinityLearning’s latest project, TrinityLearning News. 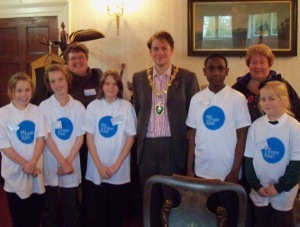 as five young reporters from Carswell Community Primary School, accompanied by Richard, Rosemary & Head Teacher Sue Gore, interviewed Abingdon Mayor Duncan Brown. The youngsters were collecting material for their very own newsletter, about and for their own community, to be distributed free to care homes and day-centres in Abingdon. From content to format and distribution, the group will make all the decisions and do all the work – in just six two-hour sessions. Besides putting classroom skills into practice, they’ll be learning life-skills like team-work, responsibility and working to deadlines. When their time with the project finishes, a new group of youngsters from another Abingdon primary school will take their place. The project is funded totally by a generous grant from The Big Lottery Fund.